Home » Fight racism » Why is Colin Kaepernick unemployed? Why is Colin Kaepernick unemployed? 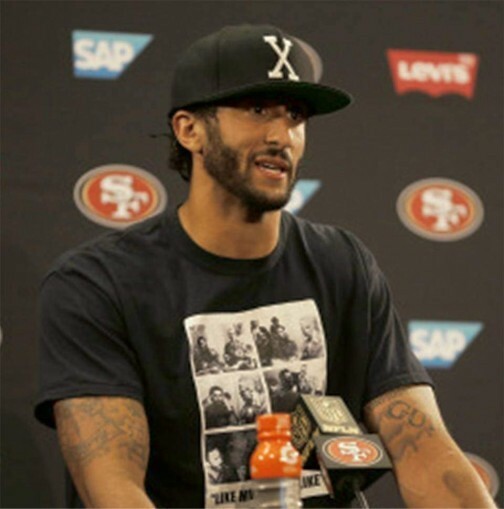 Wearing a shirt showing the 1960 meeting between Fidel Castro, and Malcolm X in Harlem, Colin Kaepernick speaks at press conference on his refusal to stand for the U.S. national anthem, Aug. 26. Super Bowl LI occurred less than two months ago on Feb. 5 and already there is much talk in the sports world about which quarterbacks are available for the upcoming 2017-18 National Football League season. One of those quarterbacks is Colin Kaepernick, who recently opted out of his contract with the San Francisco 49ers to become a free agent. Kaepernick, who is African-American, took a heroic stance last season when he protested during the playing of the national anthem to bring worldwide attention to police brutality and other forms of U.S. racist oppression. Kaepernick also stated that there was no fundamental difference between Trump and Clinton when it came to the elections. His action of taking a knee drew both admiration among other athletes and wrath, especially among NFL owners. While lesser talented quarterbacks have already been reassigned, Kaepernick hasn’t received one offer as of now. Many prominent people are asking: Has Kaepernick been labeled a “distraction” because of his political stance or because he was on a poor football team? It is no secret that some of the NFL owners, many of whom are billionaires, have expressed political hostility toward Kaepernick and view him as a social pariah. Some are outright Trump supporters like Robert Kraft, the owner of the New England Patriots. And then there is Johnny Manziel, the former Cleveland Browns quarterback, a known abuser of women as well as drugs and alcohol. Manziel is now being considered as the backup for the New Orleans Saints lead quarterback, Drew Brees, who openly criticized Kaepernick for his protest. Kaepernick has stated that he will end his protest for the upcoming season. This, however, does not matter to those influential bosses who neither forgive nor forget athletes like Kaepernick whose actions they know will continue to resonate within growing movements for many years to come.